This is Occupy 2.0 and Occupy Colleges is a part of that mission. Lately, I keep getting asked , "Why is Occupy Colleges so focused on the January 17th Occupy Congress event? Isn’t the organization dedicated to student loan issues and tuition hikes?" I find the question odd because it is precisely the tuition hikes and student loan issues that connect students, teachers, and alumni to Occupy Congress. These are the economic injustices that we face in the college community. But, first and foremost, we are the 99 percent and we support Occupy Wall Street. Occupy Wall Street is addressing the economic injustices that we all face. Until recently, the focus has been on Wall Street targeting the financial industry for its misconduct. This is important and necessary but, there is a need to focus on the other one percent – Congress! Congress is the one percent that controls our legislation – yes, they are bought off by the players on Wall Street, but our legislators are also the ones who ultimately make our laws. The National Event held by Occupyyourcongress.info on January 17 is Occupy’s first unified step to address Washington. Occupy needs to continue to find its footing on K Street and the January 17th National Occupy Congress event is the perfect foray into the Beltway. It could possibly be one of the largest marches since the Million Man March in 1995. 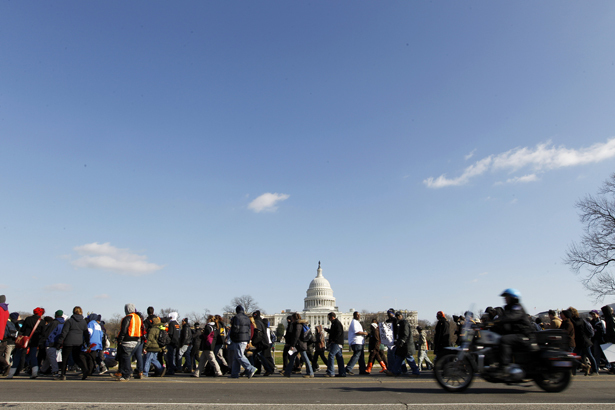 Occupiers and concerned citizens from all over the country are caravaning to the nation’s capital. OccupyLA and Occupy San Diego are teaming up for a three-day bus tour across the country ending up in DC right before the start of the march. Congress has had a major negative impact on the lives of current and former students in past years. The no-bankruptcy option for student loans, the vote for the NDAA bill and Congress’ support for the for-profit college system are recent examples. For all of these reasons and more it is imperative to turn our focus to Congress especially in a year we can do something about it by voting. For a start we can try to vote every single legislator out if they voted for the NDAA. That would be a good start and it would be useful to highlight incumbents’ voting records even if they don’t stand much chance of being upset. This is Occupy 2.0 and Occupy Colleges is a part of that mission. It is our goal to go straight to the top and focus on our lawmakers. The only way students will see reductions in fees, adjustments in student loans, and jobs after graduating is if we focus on how we got into this mess in the first place and what needs to be done to fix it? We require our elected Congress to have integrity and fight on behalf of the 99 percent not for the one percent. Finally, we all need to support Occupy Congress on January 17th. This is only the beginning. We hope you can join us to kick off the fight against the other one percent — Congress! If you can’t make it to Washington DC and you are a college student, consider organizing a solidarity march on your campus. It is time to show our country that we support each other and that any injustice against part of the 99 percent is an injustice against us all.